The Queen Elizabeth Pocket Beagle's head is in proportion to the body. The skull is fairly long, slightly domed, not too narrow or too broad. The ears are set near and moderately low, long, rounded, not narrow. The ears should not be excessively heavy. The muzzle is of fair length and straight with the top moderately defined, not Roman-nosed or thin. It is proportional to the face. The muzzle can be moderately square cut or rounded, but should not be pointy or dish-shaped; it should come to a blunt end. The chin is definite enough to preclude snippiness. The teeth meet in a scissor bite. Eyes are large and round, with a gentle, soft and intelligent expression. Any eye color is allowed. The skin covers well and is not excessively loose. The neck should be well proportioned to the body, not too thick and not too thin. The neck can be of medium length to moderately long, but is never short or excessively long. The throat should be clean and free from folds of skin. The sloping shoulders are clean, muscular, not heavy or loaded, and convey the idea of freedom of action with activity. The back is moderate to medium in length. The length from back of the front leg to stop of the tail is preferred at a ratio of no more than 1:5 compared to height. 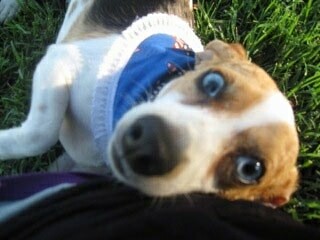 The overall substance of the dog should be proportionate, without being overly light or cloddy. The hindquarters are strong and cleanly muscled. The tail is moderate as compared with the size of the dog, and free of kinks or twists. Tail set may vary so long as it is not carried tightly onto the back. The coat is short to medium and sleek with good hair coverage. The Queen Elizabeth Pocket Beagle may have a softer coat or a slightly harsher, hound-type coat. All colors are allowed. The Queen Elizabeth Pocket Beagle is a family dog first. 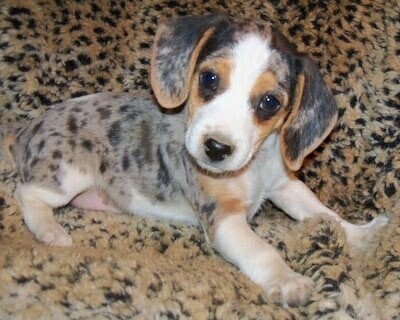 It has less of a hunting instinct than most other hounds as a lot of the Beagle in it has been bred out. It should have a love for humans and a preference for its master over its canine pack. Less vocal than its predecessor the Beagle, the Queen Elizabeth Pocket Beagle has a diminished prey drive and a lower activity level, making it more suited to the sedentary life of a house pet. 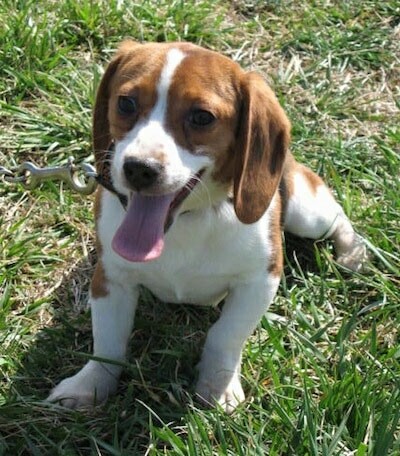 The Queen Elizabeth Pocket Beagle is a gentle, sweet, lively and curious dog that just loves everyone; a happy little tail-wagger! It is sociable, brave, intelligent, calm and loving. 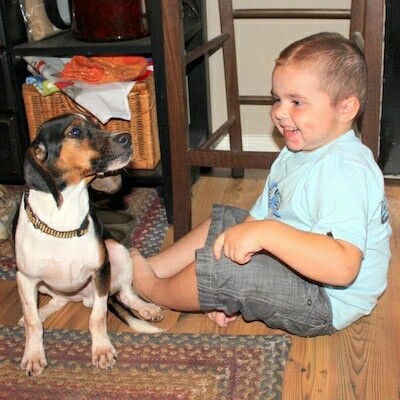 Excellent with children and generally good with other dogs. It is a gentle, typically calm dog, but it has a lively and curious nature, making it entertaining with children and generally good with other dogs and pets ideally when socialized with them from early on. These dogs are cuddly and love to be near their owners. However, they should be walked on a leash and confined to a fenced yard because they love to explore. This breed needs a firm, but calm, confident, consistent pack leader along with daily pack walks in order to be mentally stable. The breed's development began in 2002 and there have not been genetic health issues. Early testing was done on breeding stock as initially selected for improvement of the breed. A corn-based diet should be avoided as it can break down the dog's immunity to skin and parasite conditions. 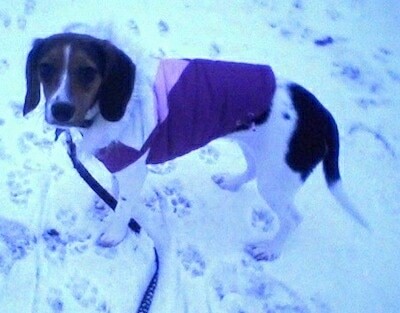 Queen Elizabeth Pocket Beagles will do okay in an apartment if they get plenty of chances to be outdoors. A small yard will be sufficient. 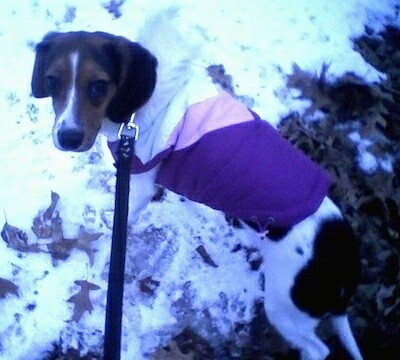 The Queen Elizabeth Pocket Beagle needs plenty of exercise, which includes a daily walk. A yard of reasonable size will take care of the rest of its requirements. It is adaptable to the owner's lifestyle and it can "keep up" with vigorous outdoor pursuits, and of course loves a good walk. 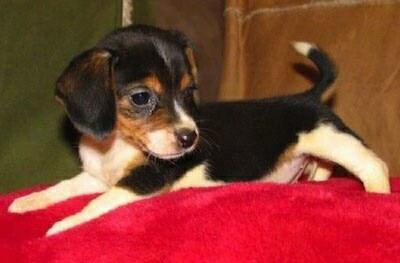 Medium litters, normally 4-6 puppies. The Queen Elizabeth Pocket Beagle's smooth, shorthaired coat is easy to look after. Brush with a firm bristle brush, and bathe with mild soap only when necessary. Dry shampoo occasionally. Be sure to check the ears carefully for signs of infection and keep the nails trimmed. This breed is an average shedder. 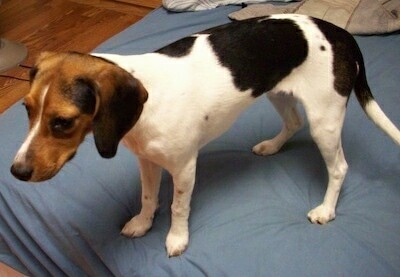 In Medieval times, there was a breed of dog called a Pocket Beagle, which stood at 8 to 9 inches. Small enough to fit in a "pocket" or saddlebag, it rode along on the hunt. The larger hounds would run the prey to the ground then the hunters would release the small Beagles to continue the chase through the underbrush into their burrows. Queen Elizabeth I often entertained guests at her royal table by letting her Pocket Beagles cavort amid their plates and cups. This genetic line is now extinct. The modern Queen Elizabeth Pocket Beagle is a re-creation of that dog. 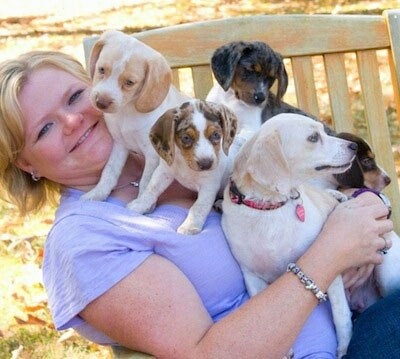 The Queen Elizabeth Pocket Beagle was originally started in 2002 by Rebecca VanMeter of Indiana. It was the foundation line for the toy breeds developed by the Queen Elizabeth Pocket Beagle Foundation breeders. Only child-safe breeds were used that were stable in temperament and were not snappish. 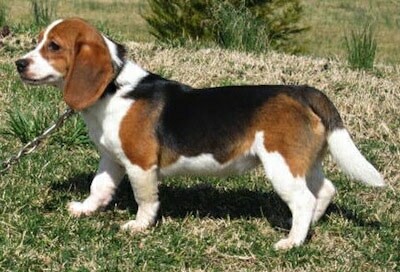 In 2011 it was decided that the Queen Elizabeth Pocket Beagle be re-categorized as a ‘toy’ rather than ‘hound,’ based on its unique genetic heritage, companion dog temperament, and smaller toy dog size. The Queen Elizabeth Pocket Beagle breed name is trademarked. All dogs registered as such must have a Queen Elizabeth Pocket Breeds Foundation birth certificate. During the developing years of the breed, all dogs shall be required this proper birth certificate for acceptance in any registry. Having two registered parents does not automatically qualify a dog for registration if it lacks this birth certificate. Any exception is a violation of the Foundation's trademark. Keeping in mind that this breed is only in its second decade from outcross, to reduce size, add colors, coat patterns, and improve health, some traits of the outcross will be visible in current generations. Though they may be awarded a lower placing, these dogs should not be disqualified from breeding or exhibition as they are vital in diversification of the gene pool. Queen Elizabeth Pocket Beagles are presented on a table in the show ring. "This is Strawberry. 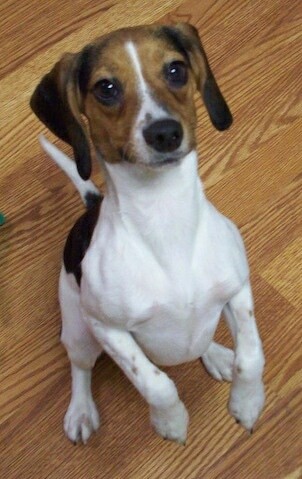 She is a 1-year-old Queen Elizabeth Pocket Beagle. She likes Ritz crackers, sunny weather, other dogs, cats and all people. She does not like cold weather or being alone, but she stays home with our other pets just fine." 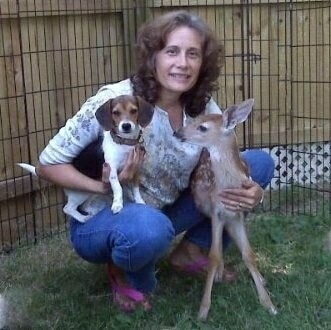 Strawberry the Queen Elizabeth Pocket Beagle—"She likes playing with her toys and our puppy Beagle Chester. Although they don't like rainy days like today because they need to be inside all day, they love taking naps together. We have taught them not to beg for food using some of Cesar's techniques. The humans eat first then we feed the dogs. People are surprised that our Beagles don't try to take our food while we eat." 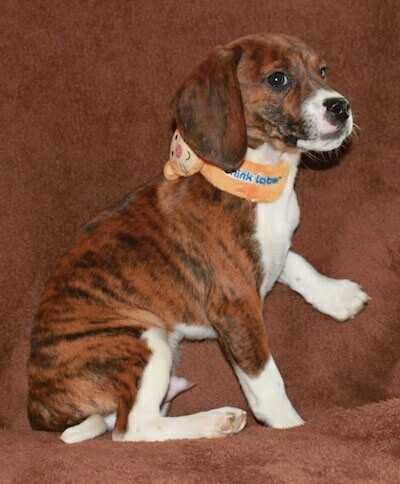 Raisinet is a lemon and white puppy bred by Candy's Beagles. Hugo is a tricolored male puppy bred by Horse Heaven Kennels.